It wasn’t until I got to the coffee gear store that I realized that I had completely forgotten my camera. I did have my phone with me, and so I took a few pictures, but my apologies that the quality of the pics aren’t as good as usual. Those are a very cute idea! I think they would sell well in the stores too. In fact, I definitely remember that coasters were a regular item for sale in the stores in years past. 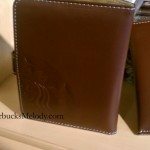 Recently, I received an email where a reader asked me if the a person could pay with a Starbucks card at the Coffee Gear store. I double checked on that today, and the answer is that a Starbucks card is not an acceptable form of payment at this time. John, the store manager, said that it’s a functionality that they are looking to add to their registers at some point, but at least right now, you can’t pay with a Starbucks card. 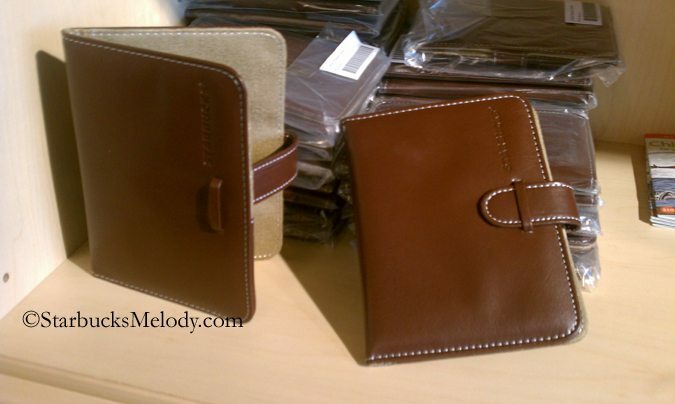 If you are a partner, you can get your partner discount on the merchandise in this store. 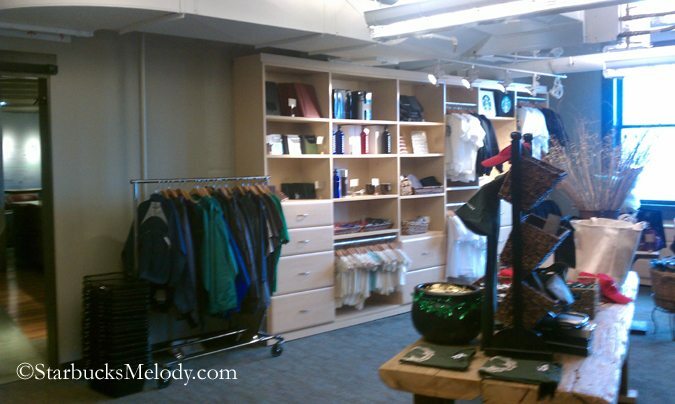 If you are a customer and you want this unusual merchandise, you need a trip to Seattle! If you are a partner, you can also find this merchandise online at the online Coffee Gear store. The FTC requires disclosure of any product or consideration in conjunction with any blog article. Today, when I walked into the store, John immediately recognized me. As I was looking around, he (and a co-worker of his) quickly put together a small gift bag for me! I was quite flattered. He had a few Starbucks t-shirts (not featured in this article) that were mislabeled when it comes to size (and thus could not be sold), and so he gave a me a t-shirt, and a couple of keychains (not featured) that had the old logo on them, and a few pens (not featured). 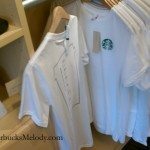 So in other words, “Starbucks has provided some promotional consideration.” I don’t think John really intended that I would write a blog post because he gave me a t-shirt, but I want to make extra certain that I comply with full disclosure. 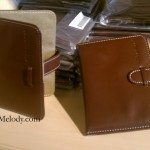 Each time I receive product in conjunction with a blog post, you’ll see this disclosure. On a separate topic, as I mentioned above, I received an email about whether the Starbucks Card was a valid form of payment at this store. This blog definitely generates some email, and I don’t answer all the emails that I receive. I tried to clean up the blog to make it extra clear that I do not work for Starbucks, and so I added a statement that I am not Customer Service in the side column. I think that has helped some, and slowed down customer service related emails being sent to me. A number of the emails have repeat topics in them. So just as a reminder, if you want to work for Starbucks, please follow @StarbucksJobs on twitter and/or check out their career center online. If you want to buy any kind of Starbucks merchandise, including city mugs or any kind of mugs, tumblers, or merchandise items, eBay is still probably your best bet. And if for some reason you have had an experience in the store that was not to your satisfaction, your best bet is to contact Starbucks Customer Service. 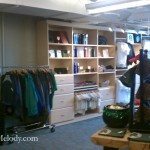 For those who are reading my Seattle’s Best blog, I wrote a very short article about Seattle’s Best merchandise at the Coffee Gear store: Seattle’s Best merchandise at the Starbucks coffee gear store. Thanks for reading and hope you enjoyed this quick update! I want the coasters. I want a thousand coasters! Bah! Melody I love this update. I would get the insulated grocery bag for sure as I am always going to whole foods. 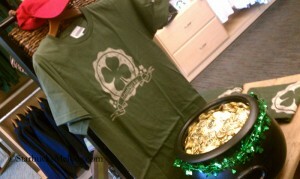 I also like the St. Patty’s day tee shirt. I think it would be nice to add the starbucks card as payment but even nicer to have some of these items available to customers online! Thanks for the update. I always love when you do posts like this!! I love logo merch, too, so I’m always really excited to see what’s new in the way of Starbucks swag. One of these days I’ll take a trip to Seattle so I can finally actually buy some of this awesome stuff! I LOVE the coasters. I think I’ll have to check eBay for those. 😀 Thanks for sharing! Melody, did you see the SBC create your deliciousness contest? I saw it and thought of you. Ahh! I love seeing all this stuff! Definitely, definitely a keychain would be on my list…I am still partial to the old logo, so when I read that my jaw dropped. But any keychain would be so awesome to have! I wish I could afford to send you all shirts, key chains, etc. I have so much random Starbucks stuff. 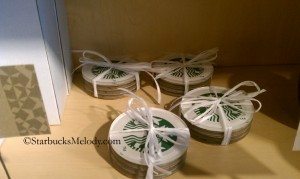 The coasters are cute, I’d buy some. And St Patty’s day falls on a weekend this year, so that shirt could technically even be worn to work (at least here it could…I recall from the dress code conversation a while back that promo shirts can’t be worn on weekends in all areas). @DeniseR (and this is kinda @dadcooks even though he’s not in this thread) and @ anyone who reads MSI — Each time I write blog posts on the Starbucks merchandise store, I have to admit, there is a part of me that thinks of the MyStarbucksIdea-participant “Cupajoe4evamoe”. He clearly doesnt read this site, but I often think he would find the coffee gear store to be quite a kick. A large percentage of his ideas sort of involve putting the logo just on “stuff” and that’s kind of what you get here at this store! ^ That wasn’t such a bad idea really. All kinds of coasters have long been part of what used to be regularly sold in Starbucks. I do like the coasters and probably might purchase them, but I think also the insulated grocery bag would sell in the stores more than a regular tote bags that are in the stores now. @Diele – I need to take a closer look at the SBC promo. Thanks for the reminder! It’s funny but this blog and the SBC blog are opposite extremes of each other in terms of readership. SBC doesn’t quite have the universal experience aspect to it that a Starbucks does. Hopefully, over time, a few more people will start reading my SBC blog, but it will be slow growth. If there were 17k SBC cafes, it would go faster. LOL Anyway, later on today, I’ll take a good look at that promo and it might be a great thing to right a blog update on. I am hoping to go sometime to Seattle. I would also love to go on an Origins coffee trip. @Melody That makes me feel better; my last trip to Seattle was in September 2008! These products look so great! 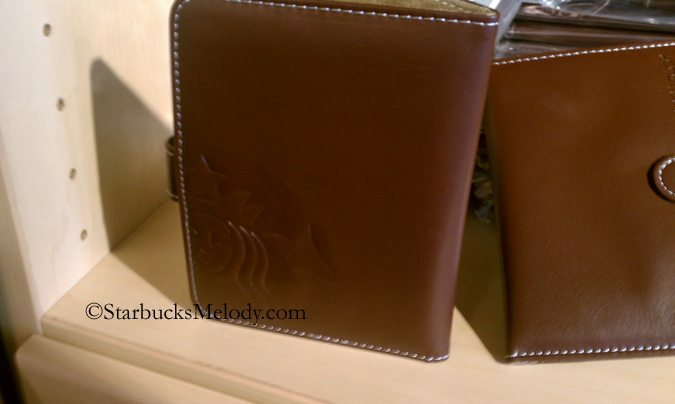 It would be awesome to have access to more quality Starbucks merchandise online! 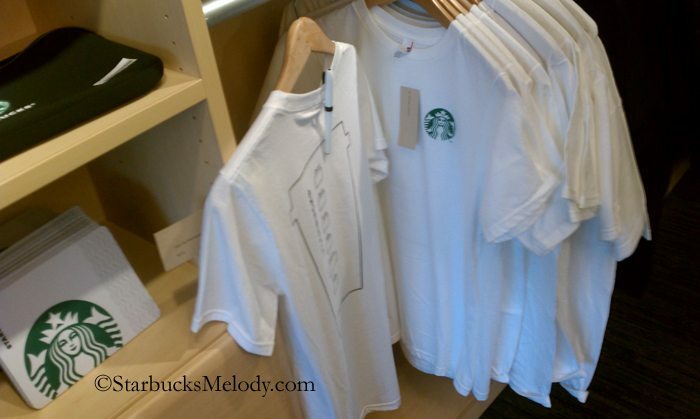 I’ve “planned” a trip to Seattle in my future just to go to the Starbucks coffee gear store! I think Starbucks would make a lot of customers happy by opening up the coffee gear website! What could be better than loyal customers supporting the brand they love!? Anyway, I’ve been wanting to ask my barista friend to get me some cool stuff online but I haven’t gotten the courage to a actually do so. I too like seeing Starbucks merchandise. I have some Starbucks coasters around here somewhere, but not those kind. Will have to stop by!